THE site of the Temple of Artemis Argrotera, in the Mets district of Athens, has been many things over the past two-and-a-half millennia. A shrine to the dark-haired huntress (as Artemis was most commonly depicted in Classical art), a place of yearly sacrifice of some 500 luckless goats in commemoration of the battle of Marathon, an early Christian graveyard and, at the turn of the last century, the location of some of the most prized properties in Athens. More recently, the land has become a battleground. On one side are the multiple owners, who have repeatedly had building applications to replace the now dilapidated houses refused. In return, the Culture Ministry has each time promised to expropriate the land without doing so. On the other side are a combination of architects, archaeologists and local residents who are strongly opposed to any future development, arguing that the only ancient site remaining on the south bank of the Ilissos river should be preserved. On November 27, work to demolish the derelict stone buildings on the site finally began, on the orders of the Central Archaeological Council. There is undoubtedly self-interest at play from some residents, who could lose unimpeded views of the Acropolis, the Temple of Olympian Zeus and Lykavitos Hill. But the Citizens of Mets Initiative, the residents' group formed to campaign against future development of the land, agree that the owners, who have been paying yearly land taxes, should be properly compensated. They insist, however, that the site should be properly excavated and unified with the archaeological sites adjoining it. More than forty years after the land was first put up for expropriation, the Culture Ministry has finally agreed to make a decision. The land is to be excavated and a judgement made on its archaeological worth, whereupon the owners will either be compensated or granted permission to build. The condition is that the demolition of the derelict buildings and the subsequent excavation be done by pickaxe, not by machinery, in the hope of preserving any remnants of the Ionic temple, which dates from the 5th century BC. The temple has featured in engravings and sketches, but was destroyed in 1778 by the Turks and used as building material in the construction of a supporting wall, visible on the lower reaches of the site, and possibly in the foundations of the current houses. Three excavations have been carried out on the land since 1897 and artefacts discovered - pediment fragments, votive vessels and the suspected remains of a church apse - have been removed. So much has been removed, in fact, that the architects of the Third Ephorate of Classical Antiquities, the body that supervises the area on behalf of the Culture Ministry, do not expect the excavations to reveal much of interest. "Building materials may be found, for instance marble from the temple," Dora Kyriakou, of the Third Ephorate, told the Athens News. "But not much else. When these buildings were put up at the start of the last century, the temple did not exist. It had already been destroyed. Even the church that replaced the temple had gone. "More realistically, we may find the remains from a nearby Roman graveyard. Of course, I can't rule out something interesting being found, but any ancient artefacts will probably be related to the graveyard and be of lesser importance." However, Kyriakou insists that the absence of any significant discoveries does not mean that the area should not be deemed worthy of preservation. "We know its history from prints and accounts, and people have drawn and sketched the temple, " she said. "The Culture Ministry and Central Archaeological Council should, in our opinion, raise the money to expropriate the land. But we are talking about a very large sum now and I am not sure if they can manage it." The first price estimate given to owners in 1998 valued the land at 472,838,000 drachmas (1.39 million euros) but that will have increased significantly. Demolition can hardly be said to be progressing apace, as workmen are virtually chiselling away at the bricks and sorting through rubble. But for the 11 owners, who sent a letter to the Culture Ministry two years ago requesting that the state of "outright seizure" of the land be ended, progress of any kind is a positive sign. Residents and archaeologists hoping to preserve the site will now have to wait for the results of the excavation. They will also be watching closely to ensure that the ministry-funded works are being carried out with proper care. Some residents have approached the workmen and requested their demolition papers, which they have to hand. "We want the site to be treated properly," said one local resident who did not want to be named. "Not only is it the site of a temple, but there are graves there which have been filled with rubble. "We want the works to be carried out carefully and for a proper excavation to take place that is worthy of the site. And the owners need to be compensated. This has gone on too long." The workmen themselves do not expect much of interest to be found, although some marble fragments were discovered within the rubble shortly after works began. 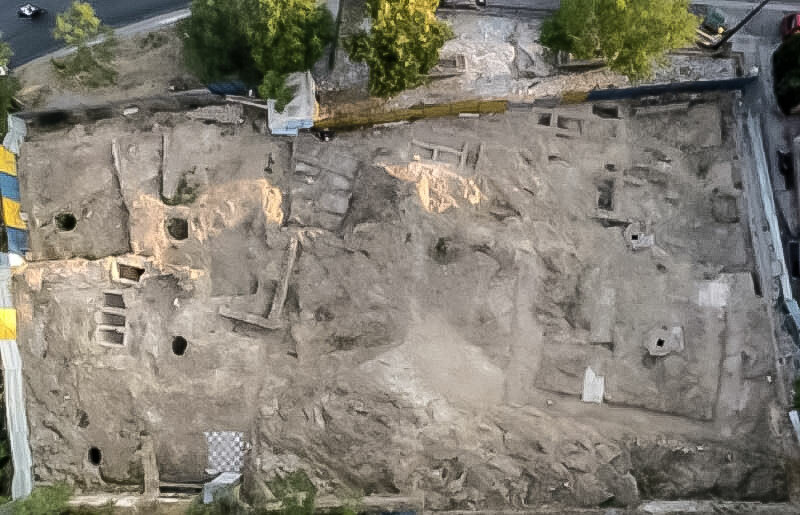 Realistically, however, it will only be when the excavation reaches the foundations that the site will finally reveal its true worth - whether it be financial to the owners, spiritual to archaeologists or visual to some residents.